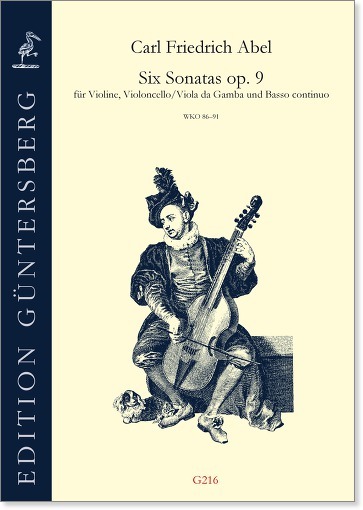 Carl Friedrich Abel’s Six Sonatas op. 9 for violin, violoncello and bass were published in London around 1772. 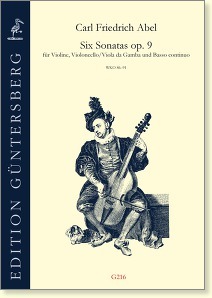 As Peter Holman suggests in his preface, the second part was probably originally written for the gamba rather than the cello. Accordingly our edition provides the second part in alto clef for the gamba as well as one in tenor clef for the cello. The bass is a figured continuo part; it can be played by a (second) cello or by a keyboard instrument. The trios are charming works in the early Classical galant style, similar to that of Abel’s Six Easy Sonattas for gamba and b.c. (G062, G063, G501). The level of difficulty is moderate.